“Spock, do yourself a favor: put aside logic, do what feels right.” Spock Prime said to Young Spock. Spock Prime reached into his pocket and retrieved a small disk, “I believe the correct human response would be, ‘Don’t take my word for it … ‘” And with that, a holographic image of an older James T. Kirk came into being. “What is a TAPE?” the younger Spock asked. Kirk went on, “If you can’t do this, seek out McCoy. Ask his advice, and, if you find it sound, take it. But if he starts the “Space is disease and danger” speech it’s best just to leave him alone, otherwise he’s likely to start jabbing you with a hypo, and that’s annoying as hell. 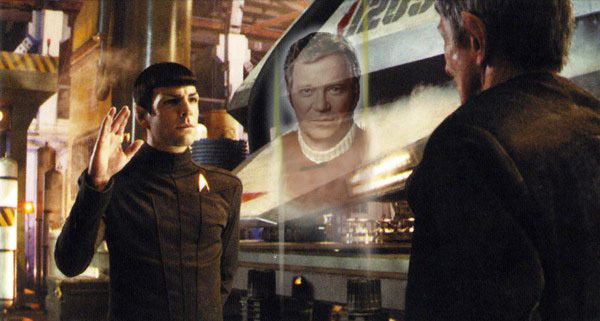 Bones, you’ve heard what I just told Spock. Help him if you can, but remember he is the captain, his decisions must be followed, without question. Thoughts on the 2009 J.J. Abram Star Trek movie → ← Press on, newspapers!